A while ago I blogged about a series I was working on which was inspired (read as "ripped") from the 2007 Doctor Who episode, Blink. Now despite the fact that this is one of the 'Doctor Lite' episodes, it is also one of my very favorite. Those damned weeping angel statue creature thingies are just so scary! Lonely Assassins they used to be called. No one quite knows where they came from but they're as old as the Universe, or very nearly, and they have survived this long because they have the most perfect defense system ever evolved. They're quantum-locked. They don't exist when they're being observed. The moment they are seen by any other living creature they freeze into rock, no choice, it's a fact of their biology, in the sight of any living thing they literally turn to stone. And you can't kill a stone. 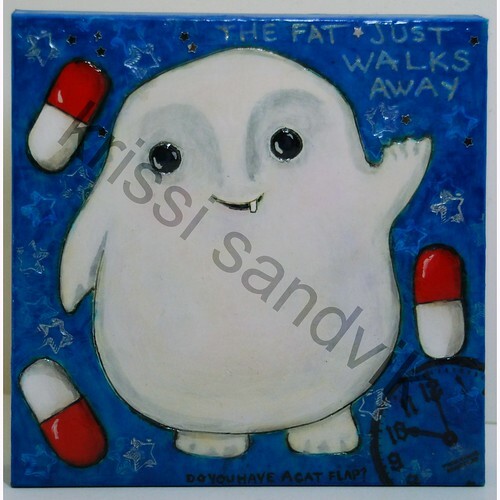 'Course a stone can't kill you either but then you turn your head away, then you blink, and oh yes it can. Fascinating race, the Weeping Angels. The only psychopaths in the universe to kill you nicely. No mess, no fuss, they just zap you into the past and let you live to death. Rest of your life, used up, blown away in a blink of an eye. You die in the past and in the present they consume the energy of all the days you might have had. All your stolen moments. They're creatures of the abstract, they live off potential energy. 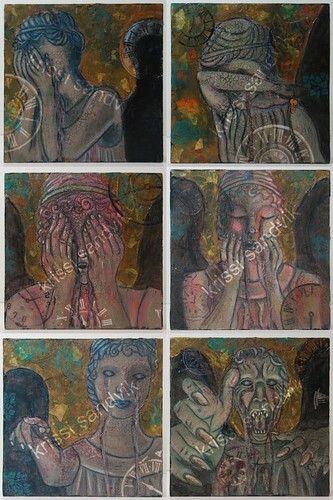 I finished the series of six 6x6x1" paint and mixed-media canvasses in early October for Side Show Studios' "666" exhibit where they seemed to miss their target audience. Since the close of the show, they had been sitting around my house waiting for me to either photograph and list them or hang them on the wall. I was thinking that maybe I was the only one who loved them, but since those Skelekitty T-shirts have been crawling up my "to do" list, the photo/list option won out. The lucky owner of these creepy little lovelies is Jennifer Alvin, DIY queen and fellow geekess. 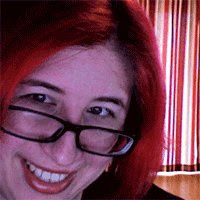 We "met" on Flickr and now I'm an avid follower of her blog, Illusionaire. Seriously, get over there and prepare to get lost in the projects and stories - you'll thank me. Oh, and did I mention that she's a dog-lover? Specifically, she volunteers with a "retired" Greyhound rescue & adoption organization called GPA-NW, and fosters some of these lucky dogs as well. You know, I'm starting to notice that a huge number of DIYers and indie crafters are involved with dog, cat and/or parrot rescues. Who knew? 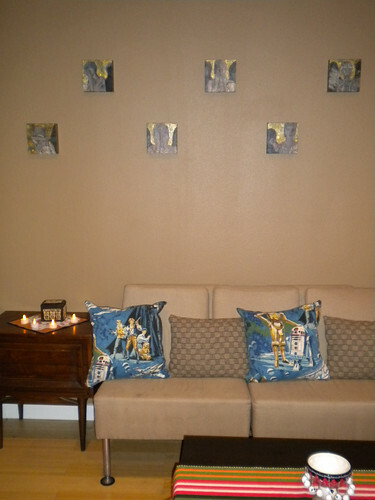 Here are the little guys hanging proudly over Jenn and Aaron's couch (where you get an idea of how iridecent the gold backgrounds are). 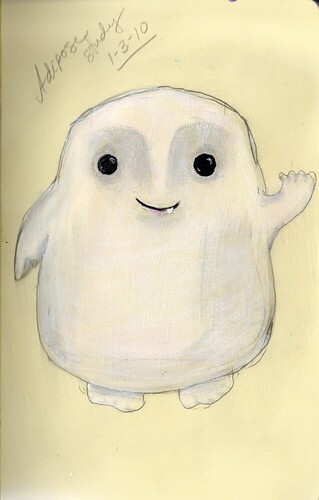 After watching the finale of 2009's Doctor Who "season" (and that word is loosly applied in this situation), I was reminded that I wanted to do a little painting of an Adipose from 2008's "Partners In Crime" featuring the return of Catherine Tate as Donna Noble (who looks a LOT like my friend Evie Turner, which is a total non-sequiter as Evie hasn't watched a single episode of the Doctor, but she most definitely IS a nerdy girl in her own right). ANY WAY... I did a quick sketch and then started to work the painting and, not surprisingly this time, he found a home before he was even finished. And here's a photo to top off this little Doctor Who fest I seem to have going. This year of geeky hotness is apparently out of print and sold out on BBC's, BBC-America's and David Tennant's sites. I managed to snag one on Amazon for an undisclosed price (much too high to pay for a calendar, if truth be told). Since I made my purchase a week ago, the calendars available have decreased in number, but increased in price. Dang. You better get one now, girls. 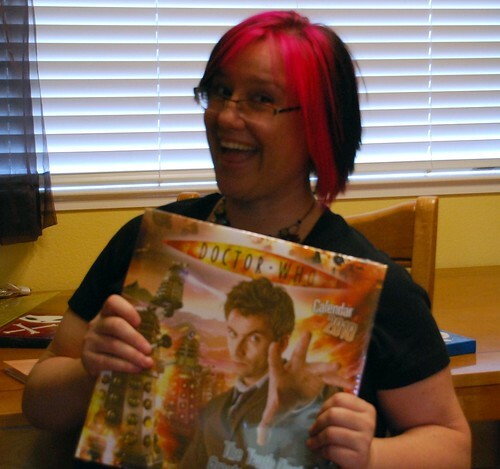 Fabulous post my geeky Whovian Sistah!